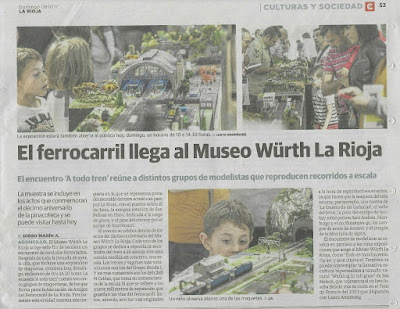 Club N Caldes organized last weekend, 7th and 8th October, a train fair at the Würth Museum in Logroño, a Modern and Contemporary Art Museum part of the Würth museums network across all Europe. Apart from the fixed and temporary exhibitions, they also provide the needed space for those who want to do any activity (exhibitions, talks, events...), provided that this activity is related to art, didactic, or strengthens the company's business. The first association is "Amigos del Ferrocarril de La Rioja" ("La Rioja friends of rails"?). They exhibited an static H0 layout recreating many sceneries from this region well known by its wines. "Anden 5" is how this group of five friends is named. They make modular T-Track layouts. Arduino is also present in their layouts to manage their roundabout or add sounds, and they also showed some independent little dioramas or "theaters", like they like to name it, showing how Arduino is used to manage switches, servos, lights..... Children can literally touch it and play with sensors to make trains inside this little theaters move. And last but not least, our Club N Caldes layout. Now it is a 16 meters long (no curves yet) digital anarchic layout, fully based on open hardware and software systems. Apart from Rocrail to manage it, the rest of software and/or firmware is developed by our own following the Loconet specifications. I say anarchic in the good sense of the word, as not all of us model Japanese landscapes, but we love to have this diversity of environments and people reacted marvelously to it. Therefore a train can depart from the Hokkaido Coal Mine, cross the rice fields and a Japanese temple, make a brief stop in Hamburg station which is after the container depot, continue through Spanish landscapes like Toledo, the ZooFarm, Jerte Valley, a Catalonian station "Martorell", then go back to Japan to cross the Terayama bridge and end up in the middle of Hoth battle from Star Wars. The only restriction for decoration is to bring something with "soul", something this member admires and arouses emotions and/or memories. And no more things to show! It was a very successful exhibition with more than 2100 visitants in just one and a half day!! And even local press came to make and article about all us!! 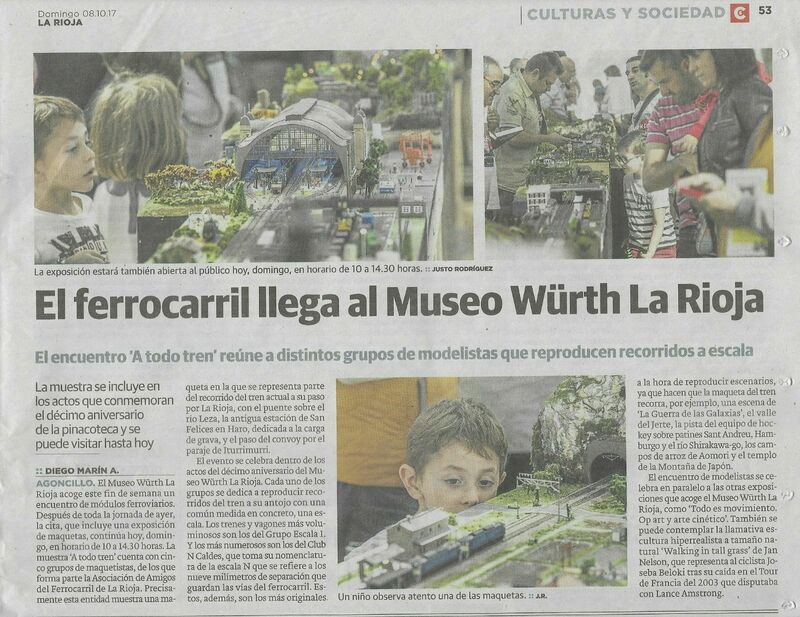 Finally, we wish to express our sincere gratitude to the Würth Museum, Würth Spain and the fantastic people working there who attended us and made us feel like at home. Thanks in the same way to all associations and clubs who supported the idea in a disinterested manner, we hope to make it better and bigger next year!! You can check many videos in our youtube channel and playlist clicking here. Experienci increíble en un marco insuperable. Otra forma diferente de mostrar las diferentes creaciones. Felicidades a organizadores y participantes y......hasta pronto. Chapeau y enhorabuena a todo el equipo!.